Humidity Chambers – Hastest Solutions, Inc.
Humidity testing is undertaken for the purposes of evaluating products, materials, and components in response to differing conditions of water vapor or moisture present in the environment. Industries such as aerospace, military, automotive, medical, and construction use humidity chambers in the testing of their products and materials due to the capability of moisture to drastically alter elements. Corrosion, warping, biological growth, and cracking are all conditions that could result from the exposure of a product or material to extremes of humidity. Therefore, it is imperative that manufacturers comprehensively test their products for the environmental conditions they will encounter during their lifespan in order to reveal these potential flaws or malfunctions. These test results allow engineers to rethink product design and manufacturing in order to produce the most reliable and cost-effective solutions for their target market. This is especially beneficial to manufacturers whose products come under guarantee or warranty because a product that has already been tested and improved is less likely to result in high reimbursement charges for the manufacturer. While high humidity is most commonly the cause of damage, in areas of low humidity, it is likely that products intended for an outdoor environment will be exposed to greater amounts of dust and/or sand and therefore it might be conscientious of a manufacturer to undergo environmental tests for those conditions too. Air moisture content ratio, or relative humidity, can be replicated in humidity chambers ranging from 10-100%. The design and construction of the humidity chambers have to be carefully considered as the manufacturer’s decisions rely on the validity of the test results. As it is a process test, chambers typically have a means of viewing and monitoring the testing procedure either through a viewing hole or through a video feed in order to record the progressive effects of the process. Test chambers can range from simple, smaller benchtop chambers that can be used to test a small component, to more complex walk-in chambers, and even drive-in chambers for vehicles and aircraft. 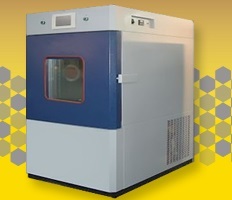 As products, materials, and components are likely to come into contact with numerous different environmental conditions, environmental test chambers are often constructed with the ability to test a combination of environmental effects. Temperature and altitude are often combined with humidity testing because of the likelihood of the existence of these effects in nature. Among all the concepts related to environmental test chambers, inarguably the most complex and misunderstood concept is Relative Humidity (RH). With a range of climate chambers, such as thermal shock chambers, vacuum chambers, industrial ovens, salt spray chambers, cryogenic Chambers, and AGREE Chambers, available, it is necessary to understand the concept, which will help you to make informed decision. RH is not an independent entity, it is temperature specific. Let us look at an example to give better insight. The moisture in the air at 68°F and 50% RH is not the same as 50°F and 50% RH. As temperature rises, its ability to hold moisture is reduced. The thumb rule is: the lower the temperature of air, higher will be the RH of air, for a given amount of water vapor in the air. The RH and its limitations are important concepts because manufacturers use dew point to describe the RH limitation. If the limits set by the manufacturer are surpassed while the chamber is being operated, it can damage the refrigeration system. To achieve lower humidity levels down to 5% RH, you need refrigeration valves installed in the humidity system that allow the refrigerated coil to go below freezing point. Additionally, a dry air purge system can be fixed to maintain a positive pressure and sublimate the frost accumulated on the coil. Commonly, three types of humidity systems are used in environmental chambers: boiler/steam generator, water bath or pan, and atomizing system. This type of system is standard on almost all sub-zero chambers. They are considered very stable; however, their response is slow. They can attain 98% of humidity and have larger capacity. However, the load of boiler can cause problems. These systems spray atom-sized drops of water into the air stream to increase humidity. It provides good control with live loads. Humidity Chambers Humidity chambers are the environmental test chambers designed specifically to replicate conditions of varying humidity in a controlled environment.